Datura, commonly known as ‘Thorn apple’ or ‘Olieboom’, is a very common weed in most crop producing regions of South Africa. It drives us all mad and they never seem to stop emerging. This weed can be an absolute curse to control and can have severe negative impacts on your crop if left unmanaged. 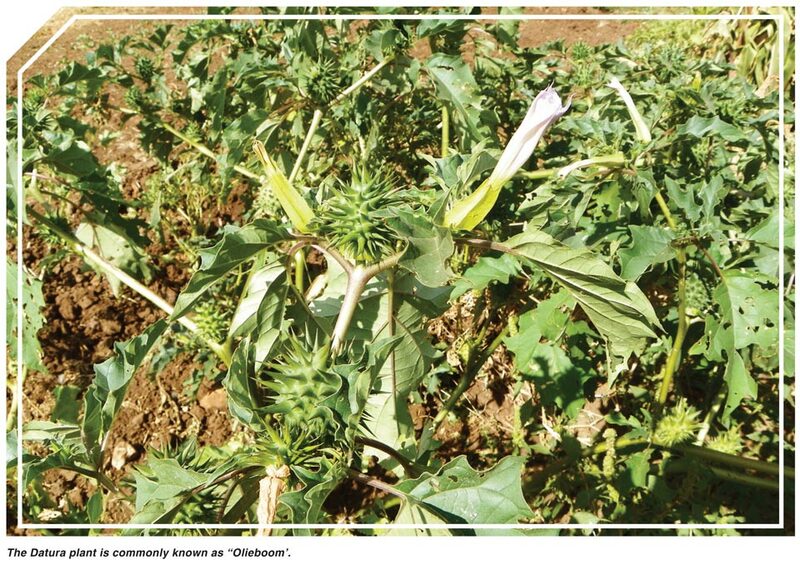 In this article we will look at the dangers associated with Datura and what we can do to manage them and the damage they cause in our crops. Datura can grow to a height of 1,5 m and is often found growing in big clusters in and around your lands. It is distinctly identifiable by its fruit which is a round pod or capsule covered in thorns. When the fruit reaches maturity these pods split open to release hundreds of small black kidney shaped seeds. Unfortunately for farmers these pods are usually splitting open at the exact time that the combines are starting to run up and down the fields during harvest time. The plants have a smooth thick stem and produce irregularly shaped leaves. The flowers are white or pale purple. These weeds are designed to be robust and resilient which is why they are very difficult to control. The fact that they spread hundreds of seeds which germinate very easily also does not help the problem. The seeds are deep germinating, which means that they need to be submerged in a layer of moist soil to germinate. This is why we notice the weed growing especially vigorously in conventionally tilled lands. There is a very significant danger attached to Datura weeds in your crops. 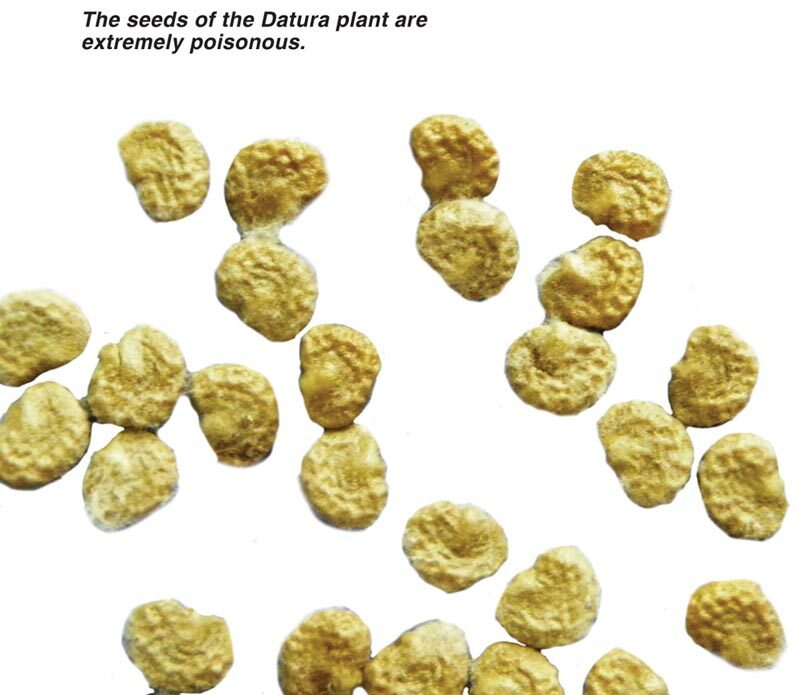 The seeds of the Datura plant are extremely poisonous to humans. If a human consumes the seeds they could experience a range of severe effects such as convulsions, hallucinations, dizziness, nausea and if a significant amount is consumed it could even lead to paralysis and death. This is why farmers need to take special care when producing maize and other crops. Farmers should always have a good weed control program which will control the establishment of this weed. If chemical control is not effective, then mechanical methods should be implemented, even if it means hoeing by hand. If farmers fail to do this then they will suffer the consequences when it comes to harvesting time. There needs to be effective control during harvesting time. Make sure that your machines have the correct sieves which are all in working order. 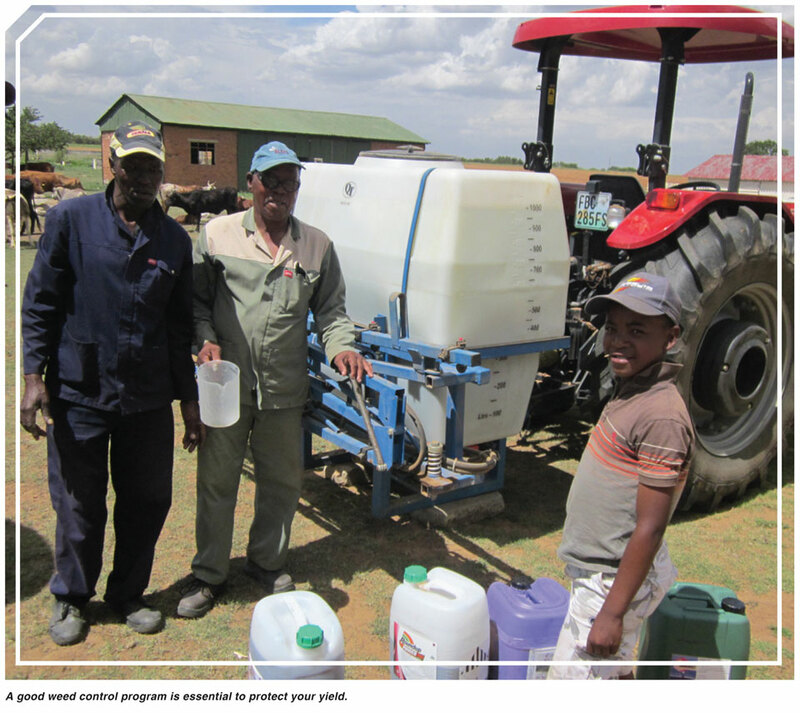 Farmers can be penalised for contamination when they deliver their maize to the co-op’s or other grain facilities which is contaminated with Datura seeds. Only a small percentage is accepted after which penalties will be handed out. In South Africa, the maximum permissible contamination of products for human consumption is one Datura seed per 10 kg of maize kernels. The farmer will suffer financially which is why we need to do all that we can to control Datura from the early stages. If you could not avoid the occurrence of Datura in your maize for some or other reason, rather than suffering the penalty it may be a wise option to sieve your own maize before delivering it. This will be costly but it will most likely pay off when you receive your full possible income with first grade maize. A farmer should always have a good weed control strategy to protect his yield. This strategy should be implemented from planting and carried through the entire growth stage of the maize plant. Our goal is for maize plants to have roots which are optimally developed so that there can be maximum access to moisture and nutrients. As farmers we have a mission which is to grow maize. We want big pips and full cobs. If this is our goal then we need to do all that is in our power to achieve this. It starts from the moment the first seed is planted until the moment the last cob is harvested. And this dedication needs to be repeated year on year. Article submitted by Gavin Mathews, Bachelor in Environmental Management.